The first time I heard about the Google Ad Grant my first thought was, “This is going to be a great way to promote local churches”. I had lofty ambitions that my local church, for instance, would connect with every person searching for “Church in Frisco”, “Student Ministry Frisco”, or “VBS Collin County”. Google Adwords allows you to target specific searches within the search engine and place a advertisement within the search results. The problem is that if people aren’t searching for “church in Frisco” my ads won’t display, and no one will be reached. The second issue involves the google bidding auction. To place ads you must bid on various keywords. I can say I’ll pay up to $5 per link click every time someone searches “Church Near Me” in the DFW area. As long as no one outbids me, my link will appear in the search results and I’ll enjoy new traffic to the website when someone clicks on the ad. Unfortunately, the Google Ad Grant has certain restrictions that can relegate Ad Grant ads to a less favorable position than paid Adword Account ads. Between targeting keywords with low search volume and being outbid by the competition many churches see very little success using the Ad Grant. The simplest way to describe the CV Outreach strategy is to say that we are looking for keywords that people who are somewhere between being a non-Christian to a nominal Christian are actually googling. In other words, what are lost people searching for that churches are uniquely positioned to answer. One of the big paradigm shifts here is that instead of churches competing against each other for online ad space, The Church could begin competing against the secular resources that are provided by the internet. 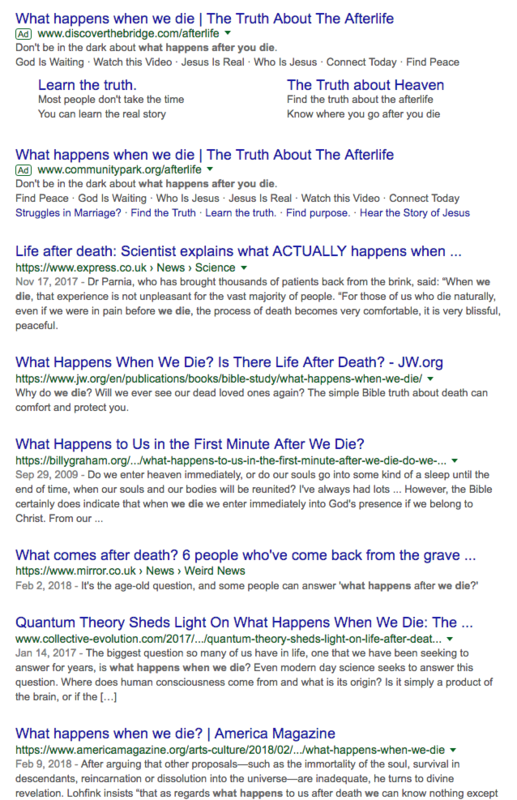 For example, a quick google search of “what happens when we die” brings up search results that include editorials where scientists try to explain the afterlife and online blogs that speak of reincarnation and offer up Oprah’s thoughts on the afterlife, as well as a link to the Jehovah's Witness website. Save for one lone link to billygraham.org, none of these organic results provide a biblical response to the question. But, using the the CV Outreach Ad Grant strategy, two of our partner churches appeared in the top two positions of this google search. This is a place where traditionally the church never existed, and now, through CV Outreach, we can begin saturating internet searches with the Gospel. These topics are just a small sample of who your church can begin reaching today. To see demo examples of the landing page topics that we are advertising to, you can check out our current content page. We’ve found that the people being connected to through these topics would never have normally sought help form a church on their own. However, through the prompting of Google they are happy to reach out. In the first three months of 2018, we connected just over 1 million people with 486 different churches and 68,000 of these visitor’s watched 100% of the gospel presentation video on the landing page. CV Outreach wants to see the Gospel permeate the online search space and we want to do it through The Church. 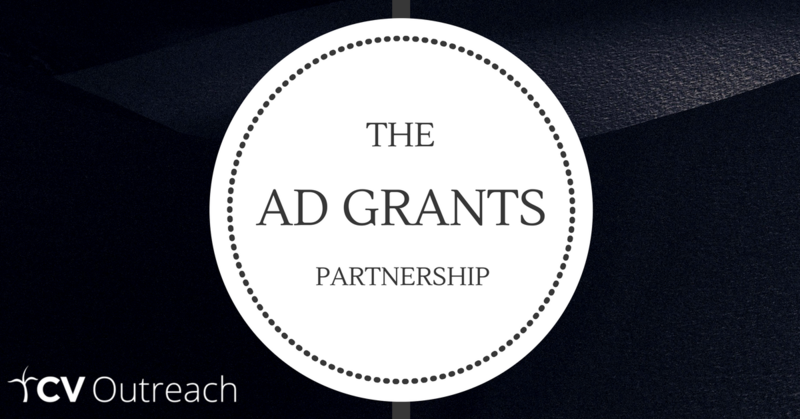 If you aren’t one of our church partners you can get started with the Ad Grant Partnership for free!